Story: Magilla Gorilla is the only pet at Peebles' Pet Store that can't find a home and an owner. He has been sold many times but he always ends up being returned to the store. The only one who want him is Ogee, and she can't seem to get the money to buy him. Background notes: The Magilla Gorilla show was yet another cartoon series by Hannah and Barbera. From a historical point-of-view, the show is interesting, as the trend with coordinated tie-ins like comics, merchandise etc. started with this series. 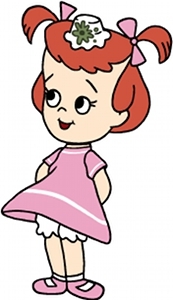 The show ran 31 episodes from 1964-65 (Ogee's voice by Jean Vander Pyl). After this, the show was on hiatus for a while, and then reappeared in The ABC Saturday Superstar Movie from 1972 and a few episodes of Yogi's Gang in 1973. After these appearances Magilla Gorilla has been used in a few new cartoons with Mr. Peebles (and the series Fender Bender 500, where he was partnered with Wally Gator), but Ogee has only appeared in the reruns. Magilla Gorilla had his own series, running 10 issues from 1964 through 1968 from Gold Key. Around the same time as #1 came out, a promotional comic called Magilla Gorilla Kite Fun Book was published by Reddy Kilowatt Inc. In 1970 a series was published by Charlton comics, this series lasted five issues. In 1972 Magilla Gorilla Moves to the Country #0 was published by Modern Promotions. This was a part of the Durabooks Series which was a series of one-shots, all issue #0. The books were not actual comics but rather richly illustrated picture books. The last appearance in comics so far, was in Hanna-Barbera Spotlight #4 from 1979, published by Marvel Comics. The launch of the cartoon was coordinated with a slew of merchandise, like figurines, board games, plates, children's books, stuffed animals etc., and merchandise with Magilla Gorilla is still produced today.